Getting the required amount of protein in your everyday diet without consuming too much meat can seem tough, maybe even impossible. It can appear especially difficult if you are vegan or vegetarian and are looking to consume vegetarian protein or plant protein. Getting all the required nutrients and minerals is just a matter of following a healthy, wholesome diet. Protein-rich meats can be substituted by simple, everyday ingredients to get all the protein your body requires. 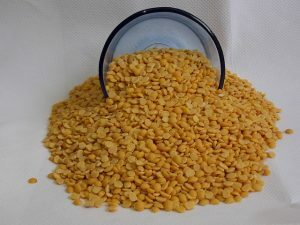 Legumes, such as chickpeas, lentils, green peas, soybeans, kidney beans, etc. are some of the most common ingredients used in vegetarian, Indian dishes. Legumes are a powerhouse of nutrients as they are rich in fibre, iron, phosphorous, potassium and B vitamins apart from protein. For instance, half a cup of cooked chickpeas contains about 7 grams of dietary protein. Dishes such as lentil curries and hummus are a great source of vegetarian protein and make a perfect substitute for meats. Legumes are often classified as incomplete proteins. However, when paired with rice, it makes a complete protein and can provide all the essential amino acids your body requires on a daily basis. Including dishes such as dal tadka, dal makhani, toor dal fry, channa masala, etc., are a simple, quick and delicious protein-fix. Tofu, or bean curd, is a plant-based protein. It makes an excellent addition to several Indian dishes and is immensely popular as a vegan alternative for paneer (cottage cheese). Half a cup of tofu contains about 10 grams of dietary proteins. It is also rich in polyunsaturated fatty acids including omega-3 fats, making it a heart-healthier alternative for high-fat meats that contain saturated fat. Curries, salads, noodles, etc. 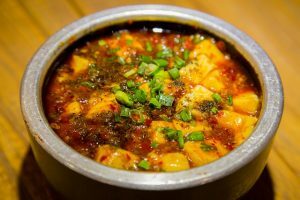 are some of the dishes that tofu can be incorporated into. Including nuts such as cashews and almonds is a great way to incorporate plant-based protein into vegetarian and vegan diets. Furthermore, nuts are excellent sources of heart-healthy fats, dietary fibre and vitamin E besides being a vegetarian protein mine. About 23 whole almonds provide about 6 grams of protein, while around 17 cashews contain just over 4 grams of dietary protein. Apart from the above, dairy products such as milk, yoghurt and cheese are also great sources of vegetarian protein. Paneer, a fresh cheese used widely in Indian cuisine, contains about 17 grams of protein per cup. Calcium-fortified non-dairy substitutes, such as soy milk and soy yoghurt, are also excellent sources of protein. A cup of milk or soy milk provides about 8 grams, and 1 cup of low-fat yoghurt contains about 13 grams of dietary protein. These ingredients work great with Indian dishes and are easily available in almost all local stores. If you lack the time to prepare your own food, then you can choose to get a meal subscription plan that includes some or all of the above-mentioned vegetarian goodness in their meal plan. That way, you can still get that vegetarian protein and keep your protein game strong! Food additives are nothing but chemicals that are added to food products to ease the processing, enhance the flavours and improve their shelf life. However, unlike the term suggests, these chemicals don’t really “add” any value to the food. Some of these additives are said to be cancer-causing and have been linked to triggering several ailments. Aspartame (E951) is a chemical compound that is most commonly used in “diet” and “sugar-free” foods. A neurotoxin and a carcinogenic, this compound is said to have drastic effects on intelligence and short-term memory. Brain tumour, diseases like lymphoma, diabetes, multiple sclerosis, Parkinson’s, Alzheimer’s, fibromyalgia, and chronic fatigue, emotional disorders like depression and anxiety attacks, dizziness, headaches, nausea, mental confusion, migraines and seizures are some of the ailments that artificial sweeteners are said to trigger. Some of the most commonly consumed food products that contain aspartame include sugar-free sodas, diet coke, coke zero, jello (and other gelatins), desserts, sugar-free gum, drink mixes, baking goods, tabletop sweeteners, cereal, breath mints, pudding, ice tea, chewable vitamins, toothpaste. MSG is widely used as a flavour enhancer in soups, salad dressings, chips, frozen entrees, and many restaurant foods. MSG is known as an excitotoxin – a substance that causes cells to get overexcited to the point of damage or death. Increased consumption of MSG can result in adverse side effects including depression, disorientation, eye damage, fatigue, headaches, and obesity. MSG is used as an additive in Chinese food, many snacks, chips, cookies, seasonings, frozen dinners and lunch meats. Trans fat is on the extreme end of the dangerous additives chart. It finds application in increasing the shelf-life of food products. Several studies show that trans fats increase LDL cholesterol levels while decreasing HDL (“good”) cholesterol, increases the risk of heart attacks, heart disease, and strokes, and contributes to increased inflammation, diabetes, and other health problems. Deep-fried fast foods and certain processed foods made with margarine or partially hydrogenated vegetable oils, baked goods, fast foods, chips and crackers are some examples of trans fat-containing foods. Sodium nitrate (or sodium nitrite) is often used as a preservative, colouring, and flavouring in processed meats. This compound is highly carcinogenic once it enters the human digestive system. Once inside the digestive system, it forms a variety of nitrosamine compounds that enter the bloodstream and wreak havoc with a number of internal organs, the liver and pancreas in particular. Sodium nitrate is found commonly in food items such as bacon, ham, hot dogs, lunch meats, corned beef, smoked fish and other processed meats. Soy lecithin is used to give products a smooth, uniform appearance. Some of the more commonly recognized side effects associated are like bloating, diarrhoea, mild skin rashes, nausea and stomach pain. Used primarily as an emulsifier, you can find this compound in anything from salad dressing to tea bags, especially chocolates. Making lifestyle improvements, exercising more and staying healthy are expected to emerge as some of the major trends this year. However, since most of us have day jobs followed by a multitude of house chores, we are all faced with one big problem – lack of time to invest towards maintaining that healthy lifestyle. We, at Masala Box, has compiled a list of simple, yet highly effective tips and trends that you can inculcate in your daily routine to stay healthy and fit without having to spend too much time. 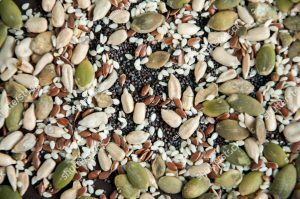 Super seeds: Often deceptive because of their size, super seeds are a powerhouse of essential nutrients such as protein, fiber, iron and omega-3 fatty acids. 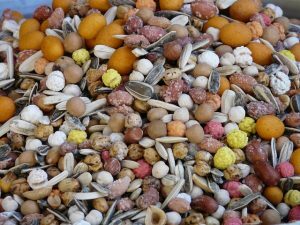 Super seeds – flax seeds, chia seeds, hemp seeds, pumpkin seeds, etc. – are easily accessible and available in most stores and supermarkets. Sprinkle a handful of these on salads and smoothies, maybe even rotis, dosas and just about anything to make your meal a power-packed one. Simple flavours: Maintaining simple, yet bold flavours is an upcoming trend in home kitchens. The rising popularity of culinary shows and books coupled with the use of equipment such as microwaves and grills are quickly transforming flavour preferences. Spicy, heavy-on-the-stomach curries are being replaced by stir-fried, grilled and boiled alternatives, whether it is a simple dinner at home or a family feast. East meets West: Fusion dishes are a huge hit in Indian kitchens currently. Dosa wraps, roti tacos, using Greek yoghurt or skyr instead of the more familiar, homemade dahi, incorporating superfoods such as seaweed, quinoa and amaranth in everyday meals are slowly becoming the norm in Indian food. Farm to table: This somewhat old trend is making a huge comeback, especially with the increasing popularity of organic food and preference for healthy eating. The use of farm-fresh vegetables and fruits instead of the mass-produced stuff not only makes the food healthier but also ensures that farmers get a better return for all their hard work. Veganism: With the rise in awareness about the health benefits of veganism, doing away with conventional staples such as milk and dairy products is no longer frowned upon (maybe with the exception of your grandmother!). More people are adopting a vegan lifestyle owing to the availability of alternatives such as almond milk, soy milk, peanut butter, almond butter, coconut cream, tofu, etc., which makes the transition not only easy, but also healthy. Gluten-free eating: Gluten-free eating is yet another upcoming trend in India, a country where the idea of wheat-less paranthas would be laughed at. As more people are learning about gluten-intolerance and the health benefits of gluten-free eating, the popularity of bhajra, millet and jowar, which are also easily available, is on the rise. Easy-to-carry alternatives and food makeovers: The preference for the consumption of home-made food is increasingly favoured as more people are focusing on lifestyle improvement and healthy eating. This shift in preference is transforming several Indian dishes, with strong and pungent flavours making way for subtle ones and deep fried items being replaced with roasted or grilled alternatives. 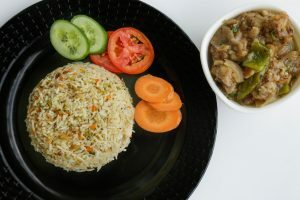 Oats upma and kichdis, Indian-style sandwiches and innovative paranthas are some of the most popular alternatives that are currently finding their way inside office lunch boxes in India. “ Biryani, a timeless gourmet classic is probably one of the most popular delicacies in India. While it is believed that the Mughals first introduced biryani in North India, it is the Arabs who brought its flavours to the South of India. Almost every region in India has its own aromatic and flavoursome version of this dish with a vegetarian version that’s equally popular in Indian homes, especially in North India. The delicious blend of spices, flavours and aromas in a biryani perhaps epitomises what Indian cooking and culinary traditions are all about. Here’s a list of just some of the many variants of famous biryanis cooked across the country. 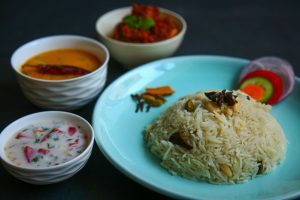 Hyderabadi Biryani: While in most biryanis the flavoured meat takes centre stage, in the layered Hyderabadi biryani, the aromatic saffron flavoured rice is given prominence. Cooked in “dum” style, it is an amalgamation of Mughal and Andhra flavours. 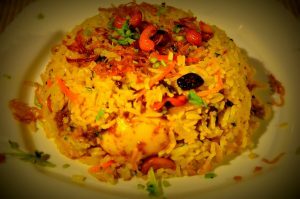 Malabar Biryani: This biryani is traditionally made in northern Kerala with a unique variety of rice called Khyma rice. The gravy with meat is cooked separately from the rice and combined at the end. Not too spicy, what sets it apart is the use of dry fruits such as cashew nuts and raisins. Lucknowi Biryani: Also, known as Awadhi Biryani and based on the Persian style of cooking, the meat and gravy are partially cooked and layered with rice. It is then cooked in dum pukht style in a sealed handi. Kolkata Biryani: This version of biryani has perhaps evolved from the Awadhi style. What makes it unique is the lighter spice content, distinct flavour and yellowish colour. 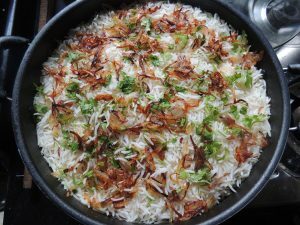 Sindhi Biryani: This biryani is quite spicy and flavoursome. What lends to its uniqueness is the fact that the meat curry is made with a lot of yoghurts. 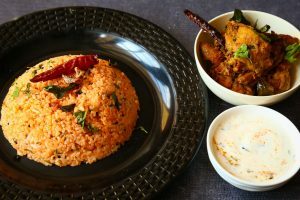 Dindigul Biryani: A very unique preparation from Tamil Nadu, this biryani is perhaps nothing like the other biryanis you get across India. It exudes subtle flavours of mint leaves and garam masala. 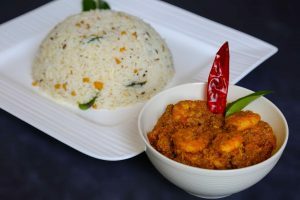 Basmati or the seeraga samba rice is used for this preparation. Bhatkali Biryani: This biryani originated from the Nawayath Muslim community in Bhatkal, Karnataka. Onions and green chilli are liberally used in this preparation. “ Life can be hard, sometimes! Your boss not recognising your hard work at office, your bae moving out of town for next weeks, your parents again comparing you to Sharma ji ka beta- all these can make things dull for you. You might roam around, trying to find some solace, warmth and comfort, only to be met with despair and lost hope. In times like these, only a heaping plate of comfort and delicious food can be your proverbial silver lining. It can remind you of the warmth of your mother’s hug or the reassurance you feel every time your day lovingly parts you on the back. Finding good comfort food, however, can be tricky. You can find a good tasty meal at your nearby five-star establishment, but nothing can compare to a plate of wholesome, homely meal filled with your childhood memories and nostalgia. Different regions of India have different comfort foods. The only thing staple in all these is the nostalgia that you feel in the first bite of these dishes. 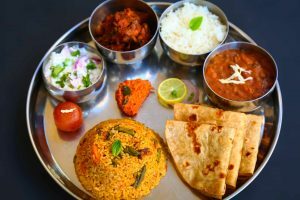 Read on to find out some awesome comfort food from the various regions of India which have been reminding people of their happy past since time immemorial. Dum aloo: – A widely preferred Kashmiri dish, dum aloo is liked by everyone. This spicy and fragrant dish has now become a national favourite, these days. This tasty dish is also not very difficult to make, making this an ideal comfort food. Idli: – These soft, spongy steamed fermented rice buns have found national fame, thanks to its simple yet wholesome taste and easy to digest properties. These can be best had with a filling bowl of sambhar or even by themselves with a dash of ghee. 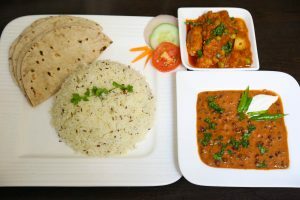 Rajma chawal: – The staple Sunday afternoon meals for many families across north India, this dish has become one synonymous with the lazy Sunday afternoons that everyone looks forward to. An ideal dish to push away any pre-Monday blues effectively! 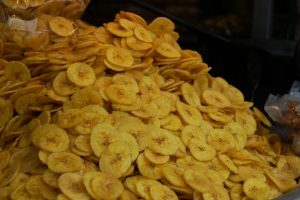 Banana chips: – While the rest of the world is still stuck with potato chips (or crisps, actually) and Pringles, we have our own banana chips. Indigenous and utterly delicious, these originally came from God’s own country, Kerela. Perfect snack for all those movie-pajama binges. Khichdi: – Time honoured and loved by all, this dish has found its appreciation across India. While in the north, Khichdi should always go with its chaar yaar- dahi, papad, ghee, achaar, the peace-loving Bengalis prefer it a little soupy and with lots of vegetables, and the Maharashtrians like the drier and less spicy avatar of this superstar. Perfect to be enjoyed on those rainy nights with a serving of petrichor on the side. Bhel puri: – This dish globally known for its taste, ease of making and mood uplifting qualities cannot be left out from this list. Unlike a lot of other delicious food, this is one of the boons for the weight watchers. Thayir Sadam: – Thayir Sadam, a famous delicacy of Tamil Nadu also known as yoghurt rice is very popular in Karnataka, Andhra Pradesh and Kerala. Made with curd and rice and often tempered with mustard seeds and curry leaves soothe the stomach and tastes heavenly. A perfect dish to end your day with. Samosa: – The national favourite snack did not even originate in India. It came to India from the middle east. But these have had such a huge impact on us that their mentions can even be found in the works of Amir Khusro and Ibn Battuta. Perfect to be had with tea, coffee, by themselves, before a meal, after a meal, basically ANYTIME. Roshogolla: – This soft white globe of love dipped in a mildly sweet syrup is one of the most potent comfort food in the entire eastern region. In fact, a popular belief prevalent in this part of the country say that there are two types of people- one, who love roshogolla; and the others who have been lying since time immemorial. Biryani: – The real king of good times, and bad times, and times when your best friend dumps you to go out with their crush! Biriyani has many avatars all over the subcontinent and is loved by all. This brilliant dish deserves entire volumes for itself. Navratri, the nine sacred days, is dedicated to Goddess Durga and her nine avatars. It is one of the most sacred festivals in Hinduism where we worship Goddess Durga or Shakti in her nine beautiful forms with great reverence. Navratri is celebrated with great fervour and enthusiasm. During the nine days, there is a feeling of festivity in the air. Different parts of India celebrate Navratri in different styles. The thing that is common is its grandeur and auspiciousness. Some fast, others feast. Some people fast for the entire nine days. They eat only fruits and drink milk. Some eat just one meal a day, which is prepared without using onion and garlic. Those who do Navratri vrat are not allowed to consume alcohol, no smoking and should not eat eggs and non-vegetarian food. The house and the Puja room should be kept clean as you are inviting Goddess Durga into your house. All people celebrate Navratri. In some South Indian states, people arrange dolls in their home like a miniature museum. This is called kolu. One diya is burned in the Puja room throughout the nine days. One red cloth and one coconut are kept in the Puja room. They also keep red sindoor, bangles, Kajal and anklets in the Puja room as these things denote auspiciousness. In Gujarat, during Navratri nights people do Dandiya and Garba, a beautiful folk dance wearing colourful dresses. In West Bengal, Odisha, Tripura, Bihar, Jharkhand, Maharashtra, Uttar Pradesh and Gujrat Navratri is celebrated as Durga Puja in praise of Goddess Durga. It celebrates both the victory of truth and greatness of feminism. During this period, the three forms of Goddess Durga – Durga, Lakshmi and Saraswati are invoked.It starts on the sixth day or Shashthi of Navratri and ends on Dashmi when the idol of the Goddess is immersed in water. 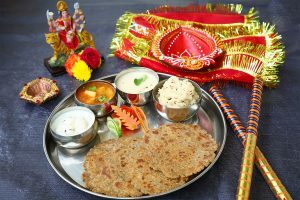 There are some special recipes which are prepared during Navratri. People cook this and distribute it as bhog to their neighbours and friends. The most popular food prepared during Navratra is the Bhog or Prasada. It may vary from region to region but its significance remains the same. In some parts, the Bhog offered differs on every day. Ghee, Sugar, Milk or Kheer made of milk, Malpua, Banana, Honey, Jaggery, Coconut and Til are offered on nine days respectively. The bhog offered in South India is known as Sundal. This is basically a dry lentil or legume preparation spiced and tempered with fresh coconut. Kala chana, safedchana, rajma and green peas are used for this. Those who follow Navratri upvas should abstain from onion, garlic, eggs, meat, fish and alcohol. They should avoid lentils and legumes too. They can eat fruits, dry fruits, milk and milk products. Special flour and grains are allowed. Tapioca or Sabudana is also a very popular thing eaten during the festival. It can be made into a sweet pudding with milk, savoury khichadi or fried cutlets with mint chutney.Upvas food should be cooked using ghee, peanut oil or groundnut oil. Dussehra or Vijayadashmi is the 10th day and it marks the end of Navratri. It means the victory of good over evil. Dussehra marks the victory of Lord Rama over the demon king Ravana. People make special food like Jalebi, BesanLadoo and Mysore Pak to celebrate Dussehra. Kheer and Poori, vegetables without onion, garlic are also made in most houses. In some places, on Vijayadashmi day tools, weapons, vehicles and productive instruments are maintained, decorated, thanked and worshipped. Ram Leela recalling the life of Lord Rama is the most loved and popular way of people celebrating the festival of Dassara across the country. 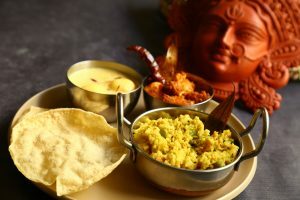 All festivals in India are celebrated with special and unique festival food. Special dishes are made for these festivals. Most people are having a very busy life running between office and home. They do not find enough time to cook special recipes for festivals. Tiffin by Masalabox solves all your problems. All the special and delicious festival food will be cooked by home chefs and delivered at your doorstep. You can avail home delivery meals. Homemade food will be delivered at your doorstep according to your convenience. Enjoy Navratri recipes cooked by Masalabox. Place your order in advance and enjoy your Navratri celebration. It is the pious time of the year when Goddess Durga is adorned with vermilion, flowers, Bangles, jewellery and then worshipped with faith and love. The nine days festival of faith, purity, and love is also called Navratri. Auspiciousness is in the air and the nine incarnations of Goddess Durga are worshipped on each day of Navratri puja. People observe Navratri vrat or eliminate onion-garlic from their meals altogether for these nine days or only by consuming fruits. 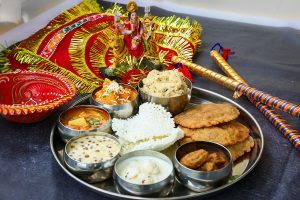 The others consume special Navratri dishes for this occasion. 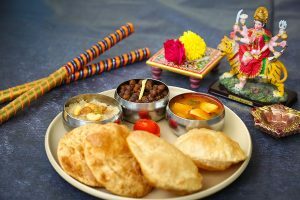 Navratri festival is celebrated with valour and joy two times in a year, first, it is celebrated in the beginning of spring and the second one is celebrated after the onset of autumn. 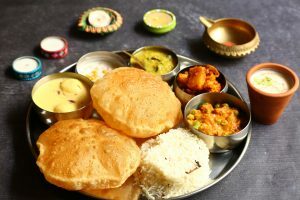 The Special Navratri dishes prepared for consumption during the Navratri fast is unique in taste and delicious. Navratri vrat ka khana is different from the food prepared on an everyday basis. Given below are nine navratra recipe especially prepared during Dussehra. These special Navratri dishes for 9 days are neither very tough to prepare nor it takes a lot of time to prepare them. This dish is brimming with carbs and it is one of the most important dishes prepared and eaten during Durga puja. It is prepared only with sabudana, peanuts and a blend of mild spices. Not only does it top the list of Dussehra special dishes, but it is also cooked during other festivals in India. Who doesn’t love Dhoklas? It is eaten both as a breakfast and snacks. During this festival, it is often savoured as Dussehra snacks. Samwat ke chawal is the main ingredient in this dish which is steamed later to make mouthwatering Dhoklas. This tops the list of another lip-smacking tea time snack and one of the easiest Navratri recepies. People of both North and south Indian enjoy the Kofta during this festival season. Who doesn’t like the sweet, chilling taste of Lassi? When it is blended with the goodness of both walnut and banana, the taste becomes heavenly for your taste buds. Though it’s a fluid, it is equivalent to any other Navratri fasting food because of the heaviness it makes your tummy feels. It’s a myth that people gain weight more than losing it during the fasting period. If your intake comprises of low-fat milk and the sugar and sweets intake is also minimum, there’s no gain in weight. This delicious recipe is made from low-fat milk and the rice especially used during Navratri. It is one of the prominent Dussehra sweets prepared at every household during Dussehra. After saying goodbye to onion for nine days, you can spend this quality time with your ever so versatile kitchen friend potatoes. This festival food uses the tangy taste of mild recipes and potatoes, making it the sixth most desired food item in the upvas food list. The name says it all. If you are a North Indian, there’s a possibility that you believe that Samos is the most heavenly snack in the world. And mind you, it really is. After a full week has passed, you can savour this lip-smacking samosa made with special singhare ka atta. South Indians and their love for Dosa is widely known. So, this dish too is widely cooked during the Dussehra festival. This is a side dish which is loved by all. It complements your samosas, and pakodas, as there is a wide variety of the Indian festival food. It is easy to cook and very tasty. Hence, to conclude, Navratra is here. What is the dish you will prepare this time? Or will you call it a holiday and contact Masalabox and order some homemade festival food and enjoy with friends and family. Either way, happy Navratri. “Thanks to our increasingly hectic lifestyle, eating has become one of the lesser priorities in life. For example, we eat only when we are meeting someone in a lavish restaurant or snack mindlessly while watching a movie. When was the last time you took out a couple of hours only to prepare food and to relish it leisurely? When was the last time you put “LUNCH” on your daily to-do list? However, eating home-cooked food is one of the healthiest habits one can cultivate. It has multiple positive effects on the body as well as on the mind. Increased knowledge of food:- Do you know which food you should eat when you feel low after those boring day long meetings? A large plate of French fries and a medium portion of rice and dal will have different effects on your body, mind and soul. Since food is our main source of energy, it can have a filling, healing or even negative effect on our bodies. 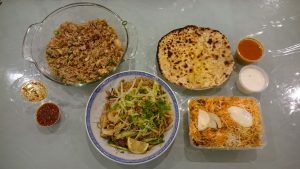 Since home-cooked food are generally nourishing and made from much lesser ingredients, the taste and effects of each ingredient can be thoroughly savoured. Of course, cooking food is not everyone’s cup of tea. A lot of factors like being pressed for time, being bone lazy after a long day and ineptitude to cook well come between us and a delicious and nutritious meal often. For my brethren who still long for some simple homely meals but are unable to find some, let me show you the light to the dark path. Log onto to “https://www.masalabox.com” to order delish and nourishing home cooked meals at affordable prices. Healthy: As much as the popular brands would have us believe, fast food is generally not the healthiest option around. The dishes are generally high in empty calories and low in nutrients. Relying on fast foods for a prolonged period of time takes a visible toll on the health. Even in the short run, fast food often makes one feel lethargic and bloated. Order from Masalabox and enjoy nutritive and home cooked meals that would not take a toll on your health and mind. Economic: Ordering out is expensive. And the corner chow mien thela does not make the healthiest stuff, either. Problem? Solution: Tiffin by Masalabox. Log on to the site and have the choice of ordering from a range of delectable and filling meals at affordable rates. Variety: Ordering food day in day out can become boring after a while. Fast food chains, corner side thelas and even restaurants offer limited menus. But with Masalabox, you get multiple choices, which changes every day. Just like at our homes, our multiple home chefs do not have the same menu – they change their menus according to the availability of fresh seasonal ingredients. This gives you a great choice, be it your Chinese cravings, or an authentic Indian Thali, you would never be disappointed. Freshness: Our home chefs are essentially homemakers who like to cook (and make some money with it). Unlike established organisations, their menus are not dictated by marketing gimmicks, but with what they find at their nearby markets each day. Needless to say that all our menus are prepared from fresh, crisp and seasonal vegetables and ingredients. Hygienic: Home cooking will always follow high levels of hygiene; after all it is something the home chefs cook for themselves as well. Hygienic cooking = healthy cooking! Contributing to the local economy: With the entire world now focusing on supporting local economies, you can do so too by ordering in from Masalabox – an Indian startup which helps local home chefs raise money from selling their cooked food at affordable prices. Next time you order something from Masalabox, be proud of your contribution to the society. Convenient: What is ordering in without some convenient? Log on to Tiffin by Masalabox, select your dish according to your craving of the day and enjoy warm, wholesome homely meal delivered at your doorstep at your convenience in a short while. Not bad, eh? Homemade food , every day! There is something about homemade food that makes everyone swoon. The love sprinkled over and the care kneaded into it makes it taste unique. You can always differentiate a homemade food from a restaurant cooked one. However, not all are lucky enough to experience this bliss every day- staying away from family and long gruelling hours at work often comes between a good homely meal and us, the lesser mortals. 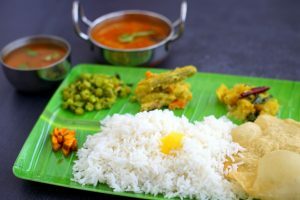 Masalabox Tiffin Service in Bangalore and Kochi, we ensure that you get this unique experience every day, even when you are staying away from home, even when you are too tired (or simply lazy) to cook for yourself. Local cuisines have made a comeback in a big way. Diners and chefs alike have shown a renewed interest in healthy food with local flavours, traditional and indigenous ingredients and cooking styles. Chefs have also realized that it is far easier to research regional cuisines, source ingredients or work with skilled cooks than trying to do the same with international cuisine. Casual Dining is gaining popularity too with chefs whipping up old-style comfort food or serving the same with a contemporary twist. 2017 saw a boom of sorts in chef-driven restaurants. Ordering food from restaurants too seems to have become passé. Top chefs today are ready to come home and make you a gourmet meal. A couple of healthy food startups even lets users choose a chef, who not just cooks and presents the meal but also shops for the ingredients! Discards: A huge trend in 2016 – onion and apple peels, broccoli stems and unusual meat cuts, otherwise just junked, found their way back on the plate in a flavourful and nutritious avatar. A conscious way to cut food wastage apparently! Food Meditation: Focus is on the food on the plate while the mind is free from positive or negative emotions. So you basically don’t talk or think while eating thus ensuring a good impact on the gut. Alcohealth: There is apparently a growing demand for alcoholic beverages with ingredients that supposedly negate the undesirable effects of alcohol and offer some nutritional benefits too. Beet infused vodka, acai blueberry mojito, superfruit acai Margarita being a few such examples. Healthy fast food: People are getting increasingly conscious of the food they eat including when they eat out. A lot of companies in the food business are trying to do away with artificial colours, flavours, sweeteners and preservatives and focus on the nutrition aspect. There appears to be an increased emphasis on authenticity and hence the last couple of years have seen a growing demand for organic and natural products. Processed food is gradually being replaced by food that is either hand-crafted or healthy food. Food packed in convenient portable bowls are available in restaurants and grocery stores. They are nutritious and versatile.